Defense Secretary Jim Mattis visited Base Camp Donna in South Texas Wednesday, weeks after President Trump dispatched thousands of active-duty forces to the border in anticipation of a Central American migrant caravan. 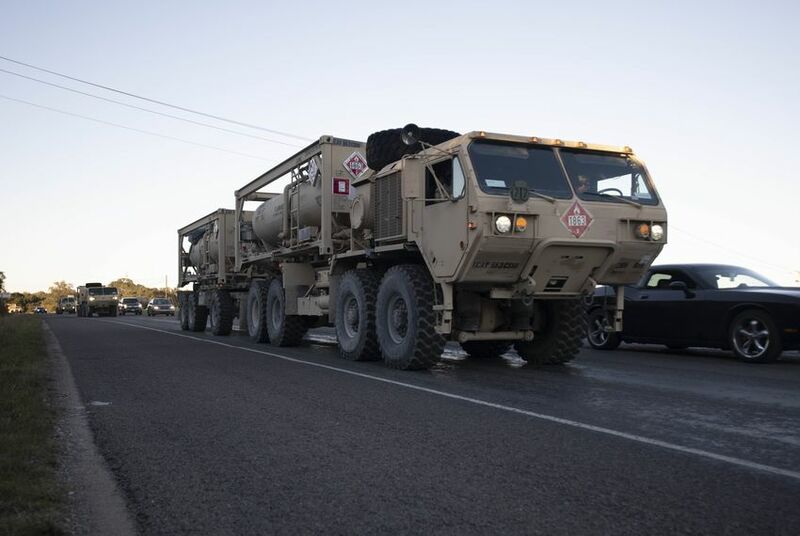 Units of the 1st Cavalry Division of the U.S. Army based at Fort Hood, Texas move south along U.S. 281 in Blanco County as convoys of troops head to the Texas-Mexico border on orders of President Donald Trump. Bob Daemmrich/BDP, Inc.
Mattis and Homeland Security Secretary Kirstjen Nielsen visited troops in Texas on Wednesday, a little over two weeks after President Trump dispatched thousands of active-duty forces to the border in anticipation of a Central American migrant caravan. Critics assailed Trump for sending such a large contingent of troops to the border ahead of the midterm elections, accusing him of mounting an unnecessary stunt designed to fire up anti-immigration sentiment among his political base. But Mattis has defended the operation to support U.S. Customs and Border Protection, saying the American military “doesn’t do stunts.” His trip on Wednesday amounted to a public-relations foray designed to present the operation as legal and nothing out of the ordinary — a necessary measure to back up border agents faced with an influx of migrants. During the flight to Texas, Mattis described the operation as a “moral and ethical mission to support our border patrolmen” and cited previous military operations on the border, dating back to President Woodrow Wilson’s deployment of the U.S. Army there to counteract Mexican revolutionary Pancho Villa’s forces. The National Guard deployed to the border during the administrations of George W. Bush and Barack Obama to aid Border Patrol, but active-duty forces haven’t deployed there since counternarcotics missions decades ago. After arriving at Base Camp Donna, Mattis met with soldiers who have been setting up barbed wire fences to “harden” points of entry in anticipation of migrants arriving from caravans headed northward. The defense secretary suggested the soldiers should disregard the controversy surrounding the mission that has surfaced in the news media. Mattis also sought to present the border deployment as good training for U.S. forces, arguing that the mission would improve their readiness and counteracting criticism that Trump was wasting the time and money of the armed forces for political effect. Trump announced ahead of the midterms that he would deploy as many as 10,000 to 15,000 troops in anticipation of the caravan’s arrival, actively publicizing a muscular military deployment that played well with his base. On Wednesday, some two weeks later, a spokeswoman for U.S. Northern Command said about 5,900 troops were deployed there at this time and significant increases weren’t expected. Northern Command previously had said more than 7,000 active-duty troops would be supporting CBP in California, Arizona and Texas. The spokeswoman for the command said Wednesday that estimate had included troops who were in “preparation for deployment” status. The active-duty forces joined more than 2,000 National Guardsmen who have been deployed to the border since April. The Pentagon initially dubbed the active-duty operation “Faithful Patriot.” Mattis later ordered the military to scrap the name and describe the mission as border support. “When the name of the mission first came in, I had given instructions, ‘I do not want to put this mission in some arcane military terms. If what we’re doing is laying wire, don’t talk about implementing a barrier plan,’” Mattis said. Mattis said there was still no cost estimate for the mission. The military deployment to the border, including the cost of National Guard forces that have been there since April, could climb well above $200 million by the end of 2018 and grow significantly if the deployments continue into next year, according to analyst estimates and Pentagon figures. The cost of the National Guard deployment from April 10 through Sept. 30 amounted to $103 million, according to Pentagon figures. The total figure for the military operations on the border this year could be lower if the Pentagon keeps the number of active-duty troops hovering around 5,000, rather than the 10,000 or 15,000 Trump had suggested. The active-duty border mission is tentatively scheduled to continue until mid-December. Several hundred members of a Central American migrant caravan with about 6,000 people have arrived at the border in Tijuana, Mexico. The rest are expected to arrive over the next several days. Most of the caravan members are Hondurans who say they are fleeing violence and poverty. Trump, who regularly mentioned the caravan in the days ahead of the midterm elections and warned without evidence that the crowd included “some bad people” and “unknown Middle Easterners,” has largely stopped bringing it up in recent days. The troops deployed at the border, meanwhile, have been stringing slinky-style barbed wire at various points of entry in Texas, Arizona and California to “harden” defenses at locations where migrants might arrive. In Brownsville, soldiers told The Washington Post on Sunday that such concertina wire is easy to put in place but difficult to remove once its barbed coils are expanded. One of the soldiers who spoke with Mattis on Wednesday brought up the matter and asked whether the “wire obstacles” his unit was installing would need to be removed later on. Mattis said right now the task was to put in the wire. Dan Lamothe contributed to this report from Brownsville, Texas.